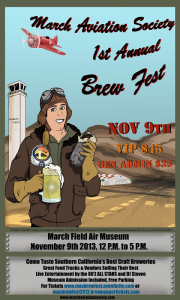 The March Aviation Society is hosting its first brew fest Saturday, November 9, at the March Field Air Museum. Attendees will be able to sample from more than a dozen Southern California breweries at the event. You gotta have food to soak up all that beer, so the organizers have scheduled nine food trucks for your dining pleasure. General admission tickets are $35 (plus a $2.92 service fee if purchased online) and grant you admission from 1 to 5 p.m., live entertainment by the ’80z All-Stars and DJ Steveo, and 15 four-ounce beer samples. V.I.P. tickets are $45 (plus a $3.47 service fee if purchased online) and give you everything that the general admission tickets give you, plus more time. You get in an hour early, at noon. March Field Air Museum admission is also included in your ticket price. Proceeds will support the military servicemembers of March Air Reserve Base and the March Field Air Museum. Tickets will be $10 more at the door. Designated driver tickets will also be available at the door. 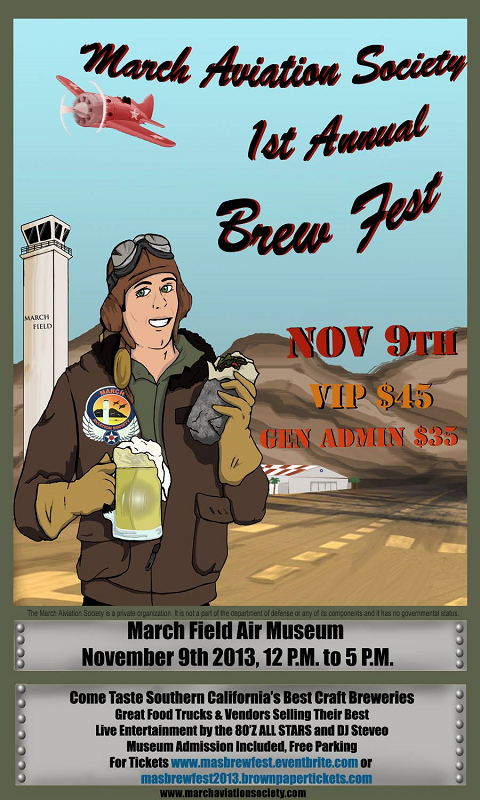 The March Field Air Museum is at 22550 Van Buren Blvd., Riverside, adjacent to the March Air Reserve Base.